Parr et al. suggest that ecdysterone should be added to the WADA list. Actually, I didn't plan to write a SuppVersity article about an agent of which everybody says that it's a waste of money, but I have to admit that the conclusion that "ecdysterone exhibited a strong hypertrophic effect on the fiber size of rat soleus muscle that was found even stronger compared to the test compounds metandienone (dianabol), estradienedione (trenbolox), and SARM S 1, all administered in the same dose (5 mg/kg body weight, for 21 days)" (Parr. 2015) in the abstract of a recent non-sponsored (no conflict of interest, either) study from the Freie Universität Berlin intrigued me. In the corresponding study, Parr and colleagues had tested the effects of ecdysterones on the fiber sizes of the soleus muscle (that's mainly slow twitch muscle fibers) of rodents in vivo and in vitro. In the less relevant in vitro study, the researchers incubated C2C12 derived myotubes with the test compounds and determination of diameters of 47 myotubes per group (mean of measurements every 10–20 µm along the myotube) by fixing the cells and using photographs of the stained cells to determine the myotube diameters of 50 myotubes every 10–20 µm along the length of the myotube (further details see Parr. 2014). As the authors point out, incubation with ecdysterone showed "sign. increased myotube diameters compared to vehicle treated control cells" (Parr. 2015 | see Figure 1). Figure 1: Myotube diameter in the in vitro study after incubation with DHT, IGF-1 or Ecdysterone (Parr. 2015). 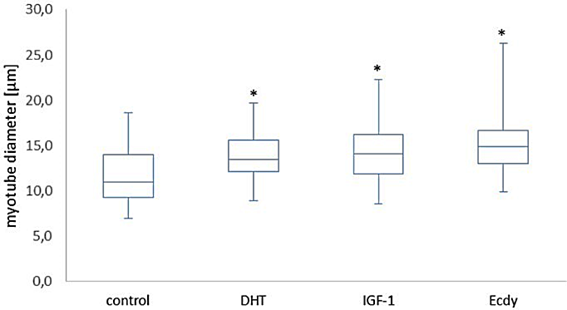 If you compare the effects of the Ecdy treatment with those of the endogenous anabolic androgenic steroid dihydrotestosterone at the same concentration and those of the anabolic growth factor IGF-1 (concentration for comparison was 1.3 nM) it is quite impressive to see that there was an (albeit non significant) advantage for an active phytoecdysteroid the Russians have supposedly used as early as in the 1980s for doping purposes. How does ecdysterone work? Previous studies already confirmed the beneficial effects of ecdysterone on skeletal muscle protein synthesis. As early as in the year 2000, V.N. Syrov published a paper in the Pharmeceutical Chemistry Journal in which the beneficial effects ecdysterone and related agents on rodent muscles were documented. Later on, Gorelick-Feldman et al. proposed direct or indirect stimulation of the PI3K/Akt signaling pathway as mechanism for this increased protein synthesis (Gorelick-Feldman. 2008 & 2010). 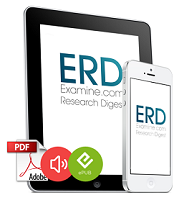 In the study at hand, Parr et al conducted molecular modeling experiments which appear to confirm that the effects of ecydesterone are mediated by estrogen-receptor-β (ERβ) binding, rather than via the androgen receptor which is the target of the many of the other drugs used. Obviously, the effects of bathing individual cells in concentrated ecdysterone cannot serve as a reliable litmus test for the anabolic prowess of an agent bodybuilders take as an oral supplement in dosages of usually no more than 1g per day. In this respect, the concomitantly conducted experiment with intact rodents is of much greater interest. 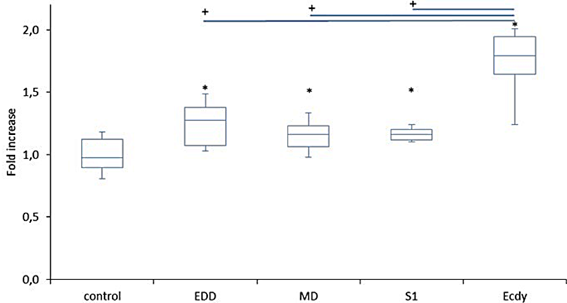 In this part of study, the authors fed male Wistar rats (n = 42, Janvier, Le-Genest St-Isle, France) either 5 mg/kg body weight of ecdysterone, metandienone, estradienedione, or the selective androgen receptor modulatar (SARM) S-1, each diluted in a solution of 20% DMSO and 80% peanut oil daily. In that, it is unfortunately not 100% quite clear if the scientists used intraperitoneal or intra-muscular injections, but the composition of the "supplement" and the fact that a previous study (Syrov. 2000) used the same dosage orally, appear to suggest that Parr et al. refer to about IP injections, which mimic oral supplementation, but have the advantage of giving rodents no chance to regurgitate the drug, when they write that the rodents "received injections". What is pretty clear, though, is that the scientists used changes in muscle fiber size of the soleus muscle of male Wistar rats as measure of the anabolic potency of their test substances. Figure 2: Anabolic effect of ecdysterone (Ecdy) expressed as fiber size of soleus muscle in intact rats (Parr. 2015). The results of the comparison of ecdysterone to the anabolic androgenic steroids metandienone (dianabol) and estradienedione (trenbolox) as well as the selective androgen receptor modulator S-1 are plotted in Figure 2. Quite impressive , no? And this is not an outlier study. As Parr et al point out, their study is not the first to show that "ecdysterone induces hypertrophy of muscles with a comparable or even higher potency as shown for anabolic androgenic steroids, SARMs or IGF-1", as analogous findings have been reported in the previously cited study by Syrov back in 2000. Human data, as well as data that would confirm similar effects on muscles that are predominantly fast-twitch (the soleus which was examined in the study at hand is mostly slow twitch) are yet missing. The latter is of particular interest, because estrogen treatment appears to favor a more oxidative (=more slow vs. fast twitch) fiber muscle fiber composition (Suzuki. 1985). Bottom line: In spite of the fact that the study provides quite convincing evidence in favor of the unexpected potency of Ecdysterone, there is a problem with dosing. 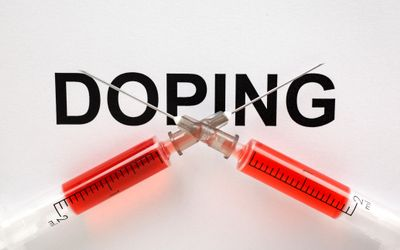 While the scientists say they used 5mg/kg body weight in order "mimic the situation in athletes", the correct rodent equivalent of the aforementioned dosages of up to 1g per day would be roughly 50-75mg/kg per day and thus far more than the meager 5mg/kg the researchers used. In other words, if they didn't accidentally give us the human equivalen dose instead of the actual rodent dose, those 1g/day some bodybuilders may be taking should be way more than you'd need to see significant increases in muscle gains and that is a problem. Why? Well, not because I'd believe that dosages as high may have toxic side effects, but rather in view of the fact that you can hardly imagine that a drug as effective as that wouldn't be all over the place in the discussions on pertinent bulletin boards. A 2006 study by Wilborn et al. even fuels the doubts, because it found no performance or hypertrophy effects in the 15 out of 45 subject of their 8-week training study who consumed 30 mg of 20-hydroxyecdysone per day from an allegedly standardized (but not tested) extract from Suma root. An even older study by Simakin et al. (1988), however, appears to confirm the existence of potent anabolic effects of ecdysterone in humans with significant increases in lean (6-7%) and reductions in fat mass (10%) in a 3-week study on 78 highly-trained male and female subjects. In view of the conflicting evidence, I am still very skeptical whether (a) the results translate to human beings, whether (b) the growth promoting effect is maybe restricted to slow twitch fibers and thus of little use to bodybuilders and whether (c) the supplements that are already being sold actually contain ecdysterones | Comment! Gorelick-Feldman, Jonathan, et al. "Phytoecdysteroids increase protein synthesis in skeletal muscle cells." Journal of agricultural and food chemistry 56.10 (2008): 3532-3537. Gorelick-Feldman, Jonathan, Wendie Cohick, and Ilya Raskin. "Ecdysteroids elicit a rapid Ca 2+ flux leading to Akt activation and increased protein synthesis in skeletal muscle cells." Steroids 75.10 (2010): 632-637. Parr, Maria Kristina, et al. "Estrogen receptor beta is involved in skeletal muscle hypertrophy induced by the phytoecdysteroid ecdysterone." Molecular nutrition & food research 58.9 (2014): 1861-1872. Parr, M. K., et al. "Ecdysteroids: A novel class of anabolic agents?." Biology of sport 32.2 (2015): 169. Simakin, S. Yu. "The Combined Use of Ecdisten and the Product'Bodrost'during Training in Cyclical Types of Sport." Scientific Sports Bulletin 2 (1988). Suzuki, S., and T. Yamamuro. "Long-term effects of estrogen on rat skeletal muscle." Experimental neurology 87.2 (1985): 291-299. Syrov, V. N. "Comparative experimental investigation of the anabolic activity of phytoecdysteroids and steranabols." Pharmaceutical Chemistry Journal 34.4 (2000): 193-197. Wilborn, Colin D., et al. "Effects of methoxyisoflavone, ecdysterone, and sulfo-polysaccharide supplementation on training adaptations in resistance-trained males." Journal of the International Society of Sports Nutrition 3.2 (2006): 19-27.